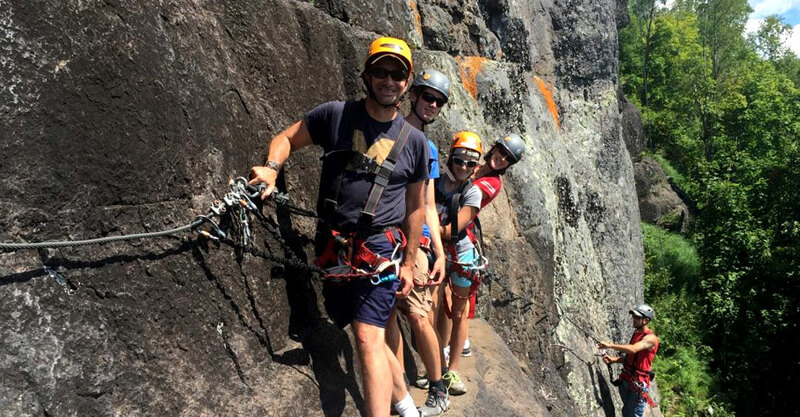 The Via Ferrata is a hike on a rock cliff equipped with metal anchors and steel cable to facilitate and secure the activity. A Via Ferrata is a mix of hiking and rock climbing. Different Via Ferrata routes offer a variety of difficulty levels and are supervised by certified guides. Monkey bridges made of two steel cables one above the other, one to stand on and another to grab with your hands. Nepalese bridges made out of three steel cables, one to step on and two others to use as railings. A ladder suspended perpendicular to the cliff facing open air. At the top, (or on your way up if you are game), you can admire views of the entire region of Ste Agathe-des-Monts. From the top, you will go down the mountain on a hike of about 750 meters to reach the Tyroparc base camp. The Via Ferrata offers a different perspectives on the Laurentians mountains and is another way to spend some exciting outdoor time. * The activity duration may vary according to weather conditions, the number of participants and their skills. The activities take place rain or shine. The management of Tyroparc reserves the right, for security reasons (weather conditions, storms), to suspend or postpone the activity. In this case, your activity would be postponed to a day and time of your convenience and according to availability. For the Via Ferrata, minimum weight is 100lbs (45 kg) and the maximum weight is 220lbs (100 Kg). Outside of these limits, if judge safe by our guide, the participants will be roped to the guide. The operator reserves the right to exclude any person he/she deems a risk for him/herself or to the rest of the group. The participant must understand he/she may leave the activity for any reason whatsoever without reimbursement. If you have any questions please do not hesitate to call us at 819 324 2002! When booking you must provide a credit card number to guarantee your reservation. In the event of cancellation or modification (date, time, number of participant) within a period greater than 48 hours, no fees will be incurred. In the case of a cancellation or modification (date, time, number of participant) within 48 hours before the day of scheduled activity, the amount for the total number of participant to the activity will be charged on your card (72 hours for groups from 10 to 20 people). In case you are unable to be present due to illness, it is possible, with valid proof from a doctor, to reimburse the person concerned.